An ancient Hindu Temple in Parwanoo, Shri Balaji Temple is dedicated to Lord Balaji who isan incarnation of Lord Vishu. The temple is a major attraction of Parwanoo and is also popular by the name of Sri Trimurti Dham Balaji Hanuman. 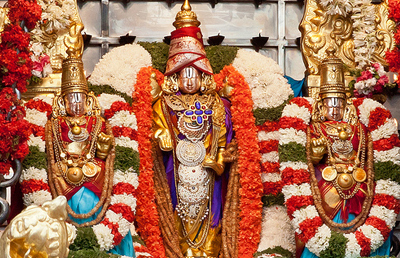 It has idols of Lord Hanuman and Lord Vishnu. As per a legend, the ancient temple was buried under earth till 1988 when it was discovered and turned up by the Archeological Department. It's a sacred placed for visitors, located in the small village named Bhairo Ki Ser on NH 22. The temple is easily approachable via Kalka city. If you are coming by bus, you can head towards NH 22 and then take the road towards Kalka and there on following the same road you will get to Shri Balaji Temple. Tourists can also hire a taxi or cab to reach the temple.